SCENE: Mack and Cap go out to some local convenience stores and pick up snacks and supplies. The news is on in one store and the story is about strange damage that occurred to some ships in the NYC upper bay. SCENE: Mack and Cap are making much use of the bunker. They have created a mini-gym, have hooked up some computers and satellite devices, and have made more formal beds. An outhouse was created leading into a sewer pipe in the room. I’m getting’ stir-crazy Mack. It’s good that we’ve been able to stay safe these past couple of days, but I need some fresh air and outdoor time. I do too, but what can we do? It’s not exactly safe out there for us. I’ve been able to make a satellite link and I have been doing my best to hash out any leads I can for your parents. So far, I got nothing. But it’s not just your parents who are missing. It appears the government has caught wind and has moved the old project information to new secure servers. It could be a while before I locate them. Maybe if we go into NYC I could snoop out some old connections. I know of some people who may be able to help us, but it could be risky. Much like before, we are facing the beast head-to-head. If that’s what it takes, I’m in. We have got to push for this. Every second counts. OK. We will go out into the city tonight. The main issue will be dodging security cameras that are linked to the DHS database. Not all city cameras are. I have to retake a look at the mainframe and find a safe route. You see that black box in the corner? (Points). There’re some flak jackets and weapons in it. Why don’t you open it up and familiarize yourself. You ever use an AR-15? Well you should take some time to learn it because that’s what we got. That and some 1911s. SCENE: Cap sorts through the weapons box and teaches himself the assembly on the guns and on the protective jackets. Mack pours through the camera mainframes to find a safe route. SCENE: Nighttime. Cap and Mack drive out into NYC. They are in plain clothes but their weapons are in the back seat. They drive into the city and arrive at a parking garage for a large apartment building. Mack and Cap step out of the vehicle and enter the building. Mack goes up to the 30th floor and goes to room 3033. Mack reaches the door’s railing and produces a key which he uses to open the door. When he opens the door a security alarm beeps but Mack enters a pass code to turn it off. Mack turns and closes the door. And why didn’t we stay at this beautiful place to begin with? Because it’s not mine. We’re borrowing it from an old friend, and, at that, very shortly. He said we can use it for 3 days max. That should give us enough time to find my contacts and see if we can locate your parents. Hopefully it will also lead us to their base operations so we can plan our next move. How did I go from so much action to so much waiting? Hey, relax man. Patience will win in this battle. At least you can have a cozy room and we can probably grab a decent slice of pizza and a bagel. That does sound good. Canned beans somehow lose their flavor after eating them 4 days straight. For now, let’s unpack and relax. I’m going to check on the feeds again and make sure we are not being followed. You stay put in this apartment. Here. (Tosses phone). It’s a simple phone because it only dials one thing- my phone. You need me, you call me. It’s radio-based so it shouldn’t be triangulated. Ok chief. See yah soon. (Sneaks onto roof and sets up mini-satellite dish with mini-computer. Begins to listen to government feeds and scans for any nearby activity. He hears a description about two missing persons describing him and Cap, but nothing that indicates knowledge that they are in NYC. Mack tunes into local channels and finds that police are investigating strange activity in the upper bay area. Something about ships sinking from huge gashes). Cap is bored and goes onto the balcony to see the NYC skyline. It’s beautiful. He takes in a deep breath and the fumes of trains, planes, and hot dog stands fills his nostrils. He takes a look up into the sky where there is a full moon. As he finishes his prayer he turns to go inside but slips on glass bottle he didn’t see. As he slips he hits the rail behind him and turns over the edge. He is able to grab and hold on to the edge with one hand. He gives a little yelp and says, “help!” Before he could say it twice, his strength causes the balcony edge to crumble and he falls. As he falls 15 stories he screams inside but is too impacted to make a sound. Upon the 14th story down cap suddenly feels that tingly rush across his body. Suddenly, a black energy essence surrounds Cap and he feels himself slowly resisting the gravitational pull. By the 10th story from the ground, he has slowed down to a mere 4 feet per second. By the time he is 50 feet above, he is gently falling like a feather, and continues to sway down until he lands on the ground in the apartment’s garbage area. He looks at himself with amazement. “WOW! That was incredible.” Cap is unsure what to make of it. “Did I just fly, or was I just floating?” Cap looks up at the ledge where he just fell from. He hops the fence from the garbage area and comes back into the hotel’s main foyer and goes up the elevators, still in disbelief. A slight grin is imprinted on his face that he just can’t shake. He walks up to the apartment room and knocks on the door. Mack looks through the peep hole and opens. Where the hell were you just now? You’re not going to believe this, but I just fell 30 stories and floated gently down. I think I’m open to anything these days. So do you mean to tell me that you can fly? I don’t know. One second I was falling, the next I was floating gently down. You got me. I haven’t tried yet. I had that tingly feeling again. I’m trying to capture the moment in my mind. (Cap tries to but is unsuccessful). Maybe it’s like a muscle or something and has to be flexed right. I’m glad you’re safe. In the mean time, why don’t we stay away from ledges until we can figure ALL of your powers. I cannot wait to fly. This is gonna be great haha! NEXT DAY: Mack wakes up Cap. Hey, I brought you some pizza and bagels. I’m going to do what we were talking about. Remember to stay here and avoid being seen. No more ledges – got it? I don’t think that’ll be a problem if you keep this room service coming. (Smiles). I’m not your maid, but, for now, I’m your deliveryman. Alright, hang tight and I will be back this evening. Keep your radio-phone with you at all times. SCENE: Mack leaves out the back door. He walks several blocks to a business district where he enters a old Chinese restaurant. He knocks on a metal door and speaks a pass-code to be let back. Mack is let in by a large Chinese bouncer. He is greeted by a female who asks who he wants to see. Chan Li is not available. Tell Chan Li that Mack Lee is here on MKSUPRE. Just a moment. (Walks back through a corridor. Returns 3 minutes later). He has become available. Right this way. Walks through a corridor and several curtains. Eventually comes to a giant wooden door that looks like ancient Chinese architecture. The door opens. Room is ornately decorated in traditional Chinese ornaments. Beautiful women are around the room attending the Chinese man with food. Please step in. (Mack steps in). (With thick accent) Why hello old friend. Long time it has been. Why you don’t visit more? Hahah! I think you know why. 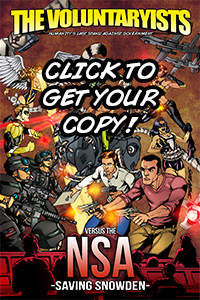 Ex-agents should be able to share war stories together, should they not? Come, sit, have some tea. So what brings you here? I haven’t seen you in 7 years. Funny how retirement changes everything. Though I hear you are not exactly retired, correct? No. I have a lot more on my shoulders than retirement to worry about at this point. I need to cut to the chase. No banter? Even when scouting, you gave a little banter during the chase. I had to make it fun. It’s easier to do that work when it’s played like a game. A game it was. I’m glad we were able to put aside those silly games and come to the same conclusions. And that’s why I’m here. I think I have the biggest piece to this puzzle. Is that right? I know there are growing rumors that the modification experiments are not just a fantasy anymore. That cosmic storm appears to have created another storm here on earth. Yes. It appears that MKINFRA has seen its fulfillment in nature. And now, as with everything, the government wants its cut. The powers that be want a piece of the action, ehh? You know, I have tried to live in peace these past years. I left the ways and the old Republic to try to redeem myself. Though, I don’t know how much more meditation I can take with all these beautiful women around, hahaha! Yes. So what can I do for you as I assume that is why you are here? What do you know about the latest developments with MKSUPRE? I am trying to locate two people – a mother and father of the missing puzzle piece. Ahh. That information is not cheap you know. It can get even old men like me in a spot I don’t want to be. At current, not much. I’ve been largely cut off. Everything I have is what I hid or can hack. How about information to trade? 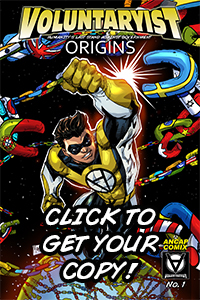 Nothing that great, except that this missing puzzle piece isn’t just for regeneration – it’s for superpowers. Flight, strength, maybe more. Interesting. I could have guessed that though. Really, anything of value to me? The end of the world as we know it might be a good one. From my intelligence so far, it looks like the global takeover is underway. Yes, but such may be an inevitable fact of life. The cataclysms of the stars are as cyclic as human existence. Yes, but we have to power to change that. I know you have less to see out of this in your own life, but what about the rest of humanity? Do you want to see your nieces and nephews under total enslavement because of the world’s goverment? Heart strings are hard to pull on this jaded heart. But you make a point. There is more to this than just me. How about this. When you do finally beat this evil, I want you to find me the most beautiful woman in the world and tell her it was me who saved the planet, then bring her to me so I can get my reward. You really never cease to amaze me. Fine. Haha! Deal. Thanks for humoring me. I find that my connection with humanity is broken in my old age – only humor brings me back to it. So I know somewhat of the details, but not all of them. From what I hear, some experiments are taking place on Plum Island. Plum Island? You mean where they do animal disease testing? Yes. The animal part is a front. The real testing is underground. Sometimes things get through – you ever hear of the Montauk Monster? Yeah, I guess I can see how that developed. So they experiment there, and, sometimes, experiments get loose. But there hasn’t been a true success until recently from what I hear, and it’s due to the black-hole event. Correct. That is what gave the government scientists the proper model from which to work. However, I hear that it’s still not quite as strong and effective as the natural event, and the effects of the natural event are the new focus for now. Thank you. I am in your debt. That you are. I prefer well-endowed blondes. Remember that. Haha! I will. Thank you. Take care old friend. You too. (Man turns to women around him) Now whose turn is it for my foot rub? This entry was posted on November 8, 2012 by Voluntaryist. 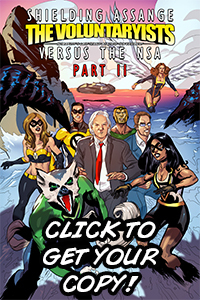 It was filed under Comic Developments, Teasers and was tagged with voluntaryism voluntaryist voluntaryists liberty anarchy libertarians anarchism comics video game movie script story book. 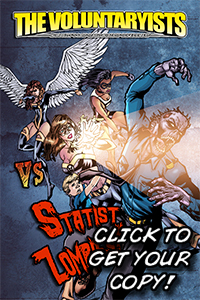 The next comic release should be before the end of October 2014: Voluntaryists Versus Statist Zombies. 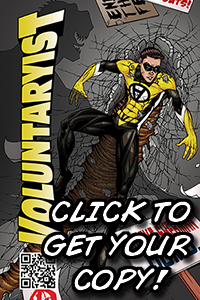 There hasn’t been any new chronological updates from the Voluntaryist beginnings accounts that is on the Background page.